Dogs that are deemed 'cat-trainable' have been tested to see how they react to cats, however, this does NOT mean they will do fine with cats immediately. We always suggest a cautious introduction as well as continued training to help ensure a healthy and safe relationship between your new greyhound and your small household pets. We use the term 'cat-trainable', rather than 'cat-safe' so you are not lured into a false sense of security. We want you to be prepared for some amount of work with introductions. We will provide you with the necessary tools and education to ease the introduction between your new pet and your existing pets. Our policy is to reserve the cat-trainable dogs for those homes that truly require them. If you have no small animals, you will need to adopt a dog that is not deemed small animal trainable. Joker is a happy, friendly boy. He likes to be around people and will likely follow you around. He's up for any adventures you may have planned. ​A fenced yard is required to adopt Irving. Maybel is a fun little girl with bonus points for cuteness. She has the best dark mask and eyeliner. She will do best with a cat that will stand its ground with her. ​A fenced yard is required to adopt Mabel. Star LOVES toys! She is a sweet, friendly, playful and happy girl. She enjoys attention from her people. ​A fenced yard is required to adopt Star. Whip is a happy, playful girl, but she will be shy initially. ​A fenced yard is required to adopt Whip. Peak is a friendly and confident girl. She likes attention but isn't pushy about it. She has crated well. ​A fenced yard is required to adopt Peak. Monte is a friendly, happy guy. He enjoys attention, but he's not a pushy dog. ​A fenced yard is required to adopt Monte. ​A fenced yard is required to adopt Chels. Irving is a friendly, confident guy. He has been affectionate, but not too pushy. Bandana is a happy, sweet & friendly girl. She enjoys attention, but she's also happy doing her own thing. ​A fenced yard is required to adopt Bandana. Carr is a friendly, confident guy. He's pretty mellow and well-behaved. ​A fenced yard is required to adopt Carr. Strider is a fun loving year and a half old greyhound / lab mix with eyes that will melt your heart. His owner moved out of the country and is in need of another loving home. He's a smart boy that already knows sit, down, stay and leave it. He enjoys the company of children . He hasn't been around cats so we don't know how he does with them. ​A fenced yard is required to adopt Strider. R​apid is beginning to figure out his new life as a pet. He hasn't had a lot of life experiences and is embracing life with his foster family. He is a sweet and friendly guy just waiting for a forever family to take him on adventures and love him. ​A fenced yard is required to adopt Rapid. House is a friendly, happy guy. He loves attention and adventures. His forever family was waiting for him when he arrived. Foster Home Update: Foster House is a big galoot of a guy. He is very cuddly and thinks he's a lap dog. He will make your legs go numb if you let him. He enjoys zoomies and a good game of steal-the-stuffy with the other hounds. He is slowly learning to sit for treats. He tolerates Monkey's teasing with patience. He will lie down anywhere - hallway, kitchen floor, living room - with a loud THUD that sounds like he fell down. He is *that* relaxed. ​He refuses to get near the stairs down to the basement although he readily ran up them when I walked him around the outside and brought him in from the lower entrance to the house. Some mornings when I am downstairs getting ready for work, I will catch him looking down the stairs at me with his 2 front paws on the top step. He goes up and down the 4 steps in and out of the house to the yard without issue so there is hope for him yet. Sleeper is a happy and friendly guy. She's an easy girl to love and is really enjoying her new life as a pet. She's up for adventure and also enjoys a good nap. Foster Home Update: Sleeper is a hoot! She’s not sleepy at all! She’s a silly, active, playful girl who loves her squeaky and crunchy toys, bones, hooves… She learned the dog door in minutes and has never had an accident in the house. She also chatters and gives kisses. This is a turn-key adoptable girl if I ever saw one. If you choose this sweet happy girlie, my loss will be your gain. Think about it for a while, no rush; I’m not quite done enjoying her. I’ve loved all my fosters, but Sleeper is a real joy! A fenced yard is required to adopt Sleeper. Sevana is a sweet girl just figuring out life as a pet and coming out of her shell. She may be uncertain in new situations. A fenced yard is required to adopt Sevana. Hey there, my name is Bing. It’s short for my professional racing name, JJ’s Baddabing. It’s a pretty cool name if you ask me. And yep, I am retired after a career as a professional athlete with 70 races and some of them were wins. Let me tell you more about myself. I’m looking for my long-term retirement home. I would love a home with kids to love, cuddle and play with me. No cats, please. I enjoy having other dogs to play with me too. I enjoy the activity of a family and people to be with. Did I mention that I can fetch! How cool would it be to have the fastest fetching dog on the block? My foster home describes me as a sweet, cuddly little thing. As well as a queen bee, I prefer the term diva. That just means I would do better with male dogs so I can be in charge of things if you know what I mean. I’m still getting used to the retired life as a pet and curious about everything! I’ve learned to do stairs and hardwood floors like a pro. Ask anyone, that’s a big deal with these long beautiful super model legs of mine. Contact my people if you have a couch for me. Yeah, it’s true I enjoy couch time too. A fenced yard is required to adopt Bing. Foster Home Update: ​ Spirit is a girlie who is happy and content within herself and her pack of greyhounds, but just doesn’t enjoy being touched by people. She has no problem taking a treat from my hand or even coming up to lick it. She’s first in line to be taken for walks and is fearless on leash. She’s reduced her boundaries considerably, but the one bridge too far is being touched involuntarily. She will now submit to being muzzled or unmuzzled, and I take the opportunity to pet her gently. She leans against me for the petting session, but it’s clear she’d rather be elsewhere. Spirit is slowly relaxing and becoming more comfortable here. She no longer bolts when I need to walk past her dish at feeding time, merely steps aside as do the rest of the girlies. When I awoke this morning, she vigorously rubbed her snout on my exposed foot. I think she may be turning a corner in her trust issues, and I’m so happy for her. Spirit will need an experienced adopter with another confident greyhound, no children, and hopefully with shy dog knowledge. A fenced yard is required to adopt Spirit. 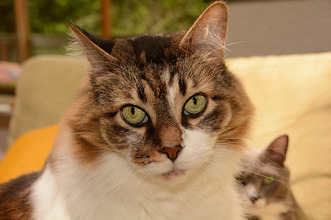 Excaliber is a friendly, happy and fun loving guy. He's up for adventure, but he can also be mellow. ​A fenced yard is required to adopt Excaliber. Kid is a friendly, mellow guy. He enjoys being the center of attention, but he also appreciates a good nap. His forever home was waiting for him when he arrived. Sabrina is a sweet, friendly girl. Her forever family was waiting for her when she arrived. Wiggles is a fun-loving, happy girl. She's up for most any adventure. Her forever family was waiting for her when she arrived. Hannah is one of those great dogs that fits right in. She loves everyone she meets and gets along well with other dogs. She may be able to live with a cat that stands its ground and lets her know who is really in charge. A cat that runs is too tempting to chase. Drama is a sweet little girl that loves a good belly rub. She is convinced that everyone wants and needs to give her that belly rub. She is a bit of a drama queen at times and has earned her name. She is a youngster she will blossom with new experiences. She needs a home with a fenced yard. She is cat trainable. We reserve the cat trainable dogs for homes that need truly a cat trainable dog. If you do not have a cat we have other dogs available for adoption. Foster Home Update: Drama is doing great as a foster dog and settling in well to retirement. She has won the pets and humans in the house over. She is still a little shy, if you call her she kind of does a circle to get to you. But, she follows her foster mom everywhere and is trying to be a lap dog. Potty training is going well. She would likely love a dog door, but does fine without one. Drama can be a jealous dog, if you try to pet another dog she will be right there to cut in on the action. She is also a hoarder and loves to take the toys and bones outside. A fenced yard is required to adopt Drama. Smokey Jones is a happy, friendly guy. A fenced yard is required to adopt Smokey. Joe...what can I say... He's a happy and friendly guy that is working hard on his manners. Foster Home Update: This little guy just turned 3 and is keeping us entertained with his puppy antics. Foster Joe is an active guy and still full of mischief. He loves to be outside and will keep you company while you get the yard work done. He’s also happy to do a bunny patrol on his own, looking for the rabbit who lives under our shed. Joe is gaining confidence and is learning to trust people. He will now take the cookie from me instead of my having to drop it for him. He has a tendency for thievery, as I have had to retrieve my garden shoes from the middle of the yard on more than one occasion. Not chewed, just relocated. This makes the younger residents have to keep their rooms picked up, as everyone knows the toys that are the most fun are the stolen ones. Joe is still quite young and will settle down once he matures a bit, but for now he is active and curious about everything and loves to be where the people are. Joe is a big cuddler and loves belly rubs and neck scratches. A fenced yard is required to adopt Joe. Talladega is a hunk of a dog, you will never go unnoticed with him by your side. He finished his career as a professional athlete and is ready for retirement as a pet.He needs a home without small dogs or cats. However, he enjoys the company of larger dogs. Foster Home Update: Talladega is doing wonderful. He is very affectionate, and is happy to see you when you come home, will greet you inside and out with happy tail and a wiggly body. He will also follow you around the house. He has strong desire to be with his family, he enjoys sleeping on his bed and yours if you will allow. He has had many outings at our local state park. He does very well on the lead on trails and loves water. When coming off the trails and into a very active area he needs a little time to regain his confidence with all the commotion. He eats well and has not been destructive at all in the home including when we are not there. A fenced yard is required to adopt Talladega. ​Ivan has come a long way since his days as a stray wondering in Wyoming. He's become a confident boy that wags his tail like crazy when he meets new people and wants to be petted and loved. ​He gets excited when he sees his foster dad put on a coat because he knows it’s time for a walk and he will sit and wait for his leash. He enjoys the walks and walks fairly well but does need to stop and sniff along the way. Ivan is very playful and loves to play “catch me” as well as tug of war with the lab in the house. A fenced yard with at least a 6’ fence is required to adopt Ivan. He can be adopted to homes with or without cats. Pocono is a happy, friendly guy. He enjoys attention and leaning on you for love. Pocono needs a home without cats and small dogs. Foster Home Update: Pocono is an outgoing, fun-loving love-bug. He uses his head to make his wishes known; he head-butts me when I come in the door after work while gently nipping at my hands. He often pushes his head between my legs from in front or behind me like a fork lift when he is really excited to see me. He loves to play with the other hounds and will initiate play by bowing and barking. He has learned to go in and out the dog door and up and down the stairs. Outside, he may chase a bird in the yard, do a couple zoomies or give a stuffie a good shaking. He taught himself to lay on the sofa while I am away at work, and he will sometimes jump up on my bed in the morning while I have my morning houndie cuddles. For the most part he is happy on a dog bed near the rest of the pack. A fenced yard is required to adopt Pocono.